Posted on Monday, November 9, 2015 at 11:01 PM into csharp, code, video & tutorial by Steve Woods. 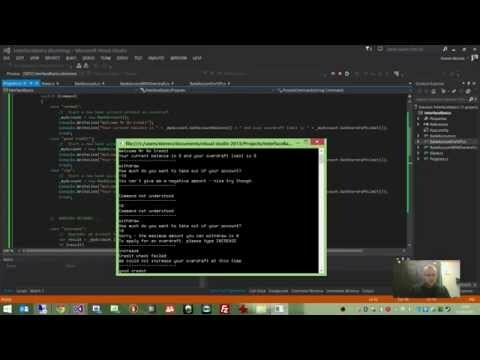 In this video we build a simulated bank machine in a Console Application to learn the basics of Interfaces and Class Inheritance with C#. The demo illustrates how different products could be offered to bank customer types, without compromising the core business logic of the application which is to allow the user to maintain their bank account from a cash machine.